Photo by Tammy Gordon The Cuban sandwich is typically pressed on a plancha or a flat grill top, making each side buttery crisp. That’s because (according to some), though the sandwich may have been born in Cuba, it was raised in the States. In the late 1800s and early 1900s, Cubans frequently traveled back and forth between their country and neighboring South Florida. The primitive form of the sandwich is said to have been developed as a lunch for cigar factory workers in Havana, Santiago de Cuba, and later, Key West in the 1860s. In the 1880s, the cigar industry shifted to Ybor City, a culturally diverse neighborhood of Tampa. There, the Cuban, Spanish and Italian influences of the neighborhood morphed the lunch staple into the Cuban sandwich as we know it today. In Tampa, you may even find Genoa salami layered in. 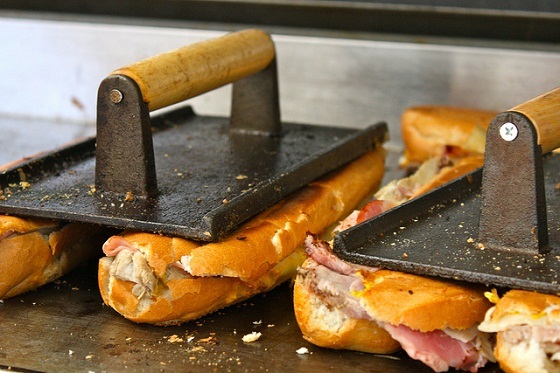 The sandwich is assembled on lightly buttered Cuban bread, then toasted in a sandwich press called a plancha (similar to a panini press but without the ridges). In its best form, it’s layered with mojo-marinated roast pork and good-quality ham. This recipe begins with boneless pork shoulder that is marinated in a mix of oregano, cumin, garlic, and soured orange juice before being slow-roasted until it’s incredibly luscious and tender.